Location : Old Goa, on top of Holy Hill, Panaji. Main Attraction : A 46 m high tower. How to Reach : Local transport within Goa is easily available. The Church of St Augustine was built in 1602. Twelve Augustan Friars combined their efforts and resources built the church on the Holy Hill at Old Goa in September 1572, which was completed by 1602. The Portuguese government later issued a ban against them. So they abandoned the church and the convent besides it. The church and the convent both are ruined now. However, the soaring 46-metre high Bell Tower still remains and forms a major segment of the ruins. The bell was removed and was put in the church of Our Lady of Immaculate Conception at Panaji in 1871. Quite amazingly, it is in working condition even today. The bell tower that remains amid the ruins belongs to one of the four of the St. Augustine Church's that once stood there. In the former days there used to be four altars, eight chapels and a convent attached to the church. 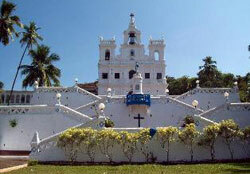 The Church of St Augustine, when it was undamaged, was considered to be the largest in Goa. The facade and half of the tower fell in 1931 and in 1938 some more parts gave way. After being uninhabited by the founders, the convent was used for charity work by the institution of the Misericordia for quite a while. The vault collapsed on 8 September 1842 due to prolonged neglect. The Government then sold the materials of the remains of the church in 1843 and has maintained the few ruins till today.